Yannick Alléno, former chef of Le Meurice, opened his second Terroir Parisien bistro in Paris in November. This outpost is located inside the Palais Brongniart, better known as the former stock exchange. It features 140 seats as well as a "rillettes bar" displaying rillettes prepared with tuna, trout, salmon or chicken, and a charcuterie space, offering pâtés, ham, and dry and blood sausages. Terroir Parisien, Palais Brongniart 28, place de la Bourse, 75002 Paris, 01 83 92 20 30. Hotel de Crillon pastry chef Jérôme Chaucesse has teamed up with master chocolatier Arnaud Larher to create a luxury Bûche de Noël. Exclusively available at Larher’s three Parisian shops, the bûche is composed of Sacher cookies, ganache, Bahibé milk chocolate Chantilly and passion fruit icing. It serves six to eight people and costs 64 €. 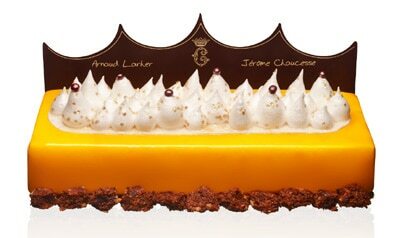 La Patisserie Arnaud Larher is located at: 57 Rue Damrémont, 75018 Paris, 01 42 55 57 97; 93 Rue de Seine, 75006 Paris, 01 43 29 38 15; 53 rue Caulaincourt 75018 Paris, 01 42 57 68 08. 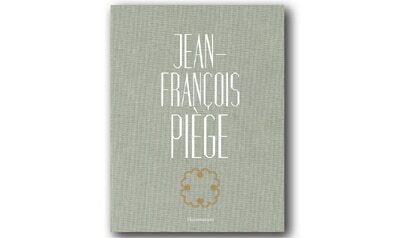 French chef Jean-François Piège (Thoumieux, Restaurant Jean-Francois Piege) has a new cookbook, entitled Jean-François Piège, that made its debut on November 13, 2013. The recipes are accompanied by more than 100 artistic photographs. Restaurant Jean-Francois Piege, 79, rue Saint Dominique, 75007 Paris, 01 47 05 79 79. Alain Senderens has sold his eponymous Paris restaurant in front of the Madeleine church to the brand Potel et Chabot that specializes in high-end catering. The former chef, Jérôme Banctel, left the stoves on October 31 and should soon helm the kitchen of a new establishment in Paris. The name of his successor has not yet been divulged. Alain Senderens, 9, place de la Madeleine, 75008 Paris, 01 42 65 22 90. Near the Champs-Elysées, the luxury Hôtel Vernet and its sumptuous restaurant topped by a glass roof designed by Gustave Eiffel are undergoing a major refurbishment. The premises will be reopened in spring 2014. Le Vernet, Hôtel Vernet, 25, rue Vernet, Paris 75008, 01 44 31 98 98. Jacques Le Divellec, owner of Le Divellec, a hallmark seafood restaurant in Paris, sold his establishment to the Costes group who already rule many restaurants in Paris, such as L'Avenue and Thoumieux. Le Divellec closed at the end of October 2013. Le Divellec, 107, rue de l’Université, Paris, France 75007, no phone.